The Wurm will eat you Now! Once upon a time, there was a gathering and I don’t mean between immortals, who are all attempting to lob each other’s heads off. The gathering in which I speak of refers to a gathering of video game developers under the banner of Messhof Games. In 2014, Messhof Games released Nidhogg, a couch co-op game that fused tug-of-war with arcade combat and it was met with positive acclaim. 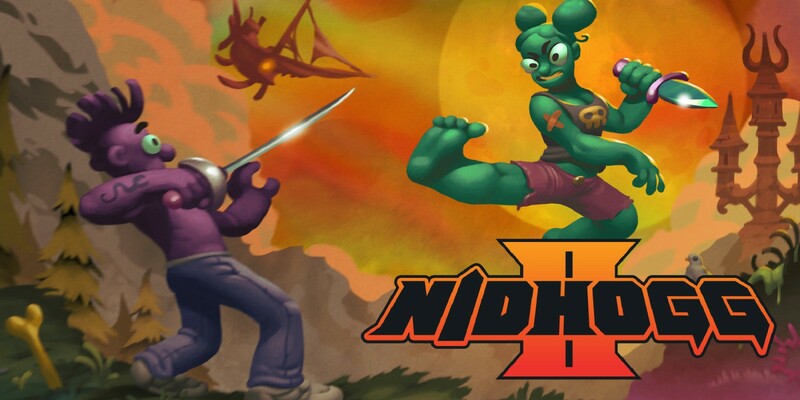 Fast forward to 2017 and a sequel was released under the name of Nidhogg 2. Instead of tasking players with beating up a series of enemies and making your way from one side of the level to the other, the only need only to kill the same enemy, who will respawn and attempt to prevent them from going beyond the Final Screen and getting eating by a Wurm. Being as though it’s 2017 release was during August, it is a little odd it hadn’t made its way to the Nintendo Switch sooner, but it’s here now and it is time to find out if it was worth waiting fifteen months for! As far as a single player campaign goes, it begins with customising your character (players can choose between the skin colours provided, as well as assign hair, clothing for torso, legs and apply facial accessories.) Only once players have customised their character to perfection, there are then 10 levels for them to then play through and they all follow the same rules. Player and CPU start off on the same screen in the centre of it and must quickly kill one another before they can make their advance. If you’re the first to die, your opponent will then attempt to rush to one side of the screen before you can respawn and stop them. Should you prove successful, it is then your turn to run and attempt to fight off the opposing CPU who will do whatever it takes to kill you. Admittedly, there is a lot of back and forth, but that’s just tug-of-war for you and each of the 10 terrains you can expect to encounter, do vary greatly and are rather catching in their own 2D pixel art way. As for how to win, the victor is whoever is able to survive long enough and make it all the way to the opposing end of various screens, where they will successfully become worm food for Níðhöggr. With regards to the manner of ways you can kill each other, although it starts off with simple fencing swords, provided you are able to advance to the next level, you’ll soon be wielding knives, long swords and even a bow and arrow, which you don’t have to keep hold off. If you are willing to throw your sword in battle, the option is there to do so, as you can always press the down button on the D-pad to pick up another. You can also choose to remain empty-handed and physically beat the enemy to death and stomp on their head. Just be careful though as cheap shots are very successful at bringing a man down, so just because you have the high ground, it only takes one great jump and the enemy on the ground can still knife you to death. Or they might just deflect your arrow and perform a sliding tackle. Also, as far as the weapons go, you will need to take consider which one suits your tastes more since there is no point in using a bow, if you refuse to take a cheap shot at an opponent as they’re running away. It’s not because you’re a coward, but you might just prefer the more personal touch of driving a small knife into the back of your enemies. You will also want to make sure you take the time to consider your surroundings. Not only are the levels stunning, but each one can come with their own hazards that can cause instant death, or slow you down. So, it certainly pays to give the creative level designs the attention that they deserve. Should you decide you have no interest in the single player content though, you can either get together a group of your friends and play locally together, or try your luck online. Personally, unless things change, I would suggest avoiding the latter as I didn’t have the best of luck finding opponents and when I did, the matches themselves would be laggy. Also, Nintendo Switch Online is required to even play Nidhogg’s online mode in the first place. So, choosing local instead of online, depending on how many of you are in the room, you can either do a quick match between 2 players, complete with changing the skin colour of your character, or you can do a 3-8 player tournament. With tournament, players can decide what cheats they wish to leave intact, assign a time limit (if you even want one) and you can even decide on what weapons will appear and yes, using your foot is optional. Unfortunately, if you were hoping Nidhogg 2 has more to offer than what we’ve covered above, well, be prepared to be disappointed because what you see is what you get and if/when you eventually tire of the soundtrack, the trippy visuals and speedy yet fluid gameplay, then you have pretty much seen all that Nidhogg 2 has to offer. Essentially, there will come a point where you will be hard-pressed to think up reasons to play it when there are so many other games on Switch that you most likely own and haven’t played in a while, which happen to suddenly seem more appealing. I’m not saying Nidhogg 2 is a bad game, but it has a shelf life and that it’s not as long as it could have been. Appealing, visually vibrant and enjoyable are the spatter of words I would use to describe Nidhogg. It is certainly an enjoyable creation, it’s just a shame that there isn’t more to it. Although it has built upon the last game in wonderful ways, the online could have been better and so could have the single player campaign, as it would have helped to make Nidhogg feel even more of a wholesome experience and worthy of its $14.99 price tag.